We’ve all heard about how important it is to get 5-a-day into your diet as it’s said to help reduce the risk of heart disease, stroke and some cancers, but also help in general well-being and health. I’d presumed that as I eat a lot of potatoes and drink a lot of juice, amongst other things, that my number would figure high in the count, but potatoes don’t count towards your 5-a-day at all, whereas interestingly enough sweet potatoes do. It also surprised me to learn that beans and pulses only count as 1 of your 5-a-day no matter how much of it you eat. Sainsbury’s has a range of recipes which count between 1 to 5, of your 5-a-day. I try the Meatball, Lentil and Cabbage Hotpot, which is 2 out of 5. The instructions are simple and easy to do, just a case of doing a bit of chopping, frying and then waiting for it to stew basically. And the result? Well, it’s a good one-pot wonder dish – a smokey, rich sauce with a refreshing coolness from the crème fraiche. 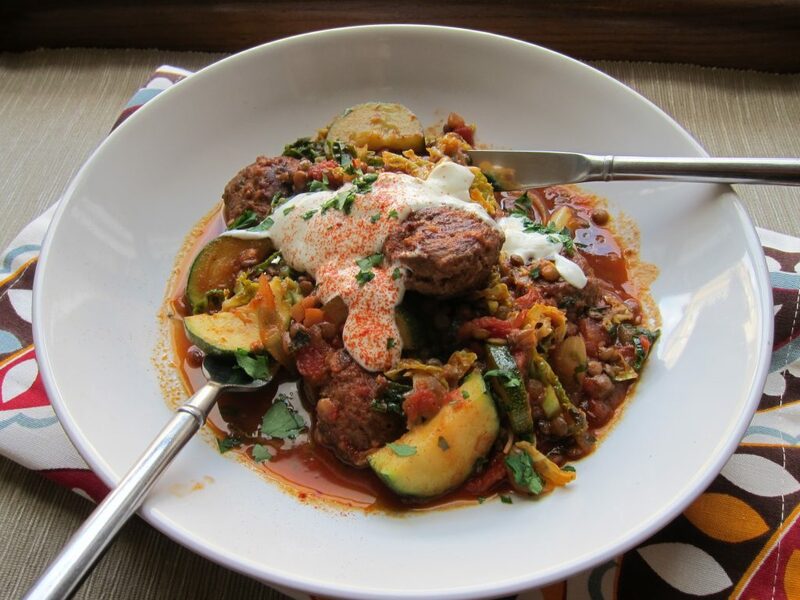 The fresh courgettes lift the dish, the cabbage adds texture, and the lentils give bulk making it filling and substantial. What lets the dish down though is the quality of the meatballs, as they taste cheap and far too manufactured. It’d worth taking a little extra time to make your own meatballs, even if you were to add just salt and pepper it would still be better than theirs. But at £1.65 per person, serving 4, I think it’s very good value overall, not forgetting the added bonus of counting as 2 of your 5-a-day. Disclosure: Food I Fancy was given Sainsbury’s food vouchers. 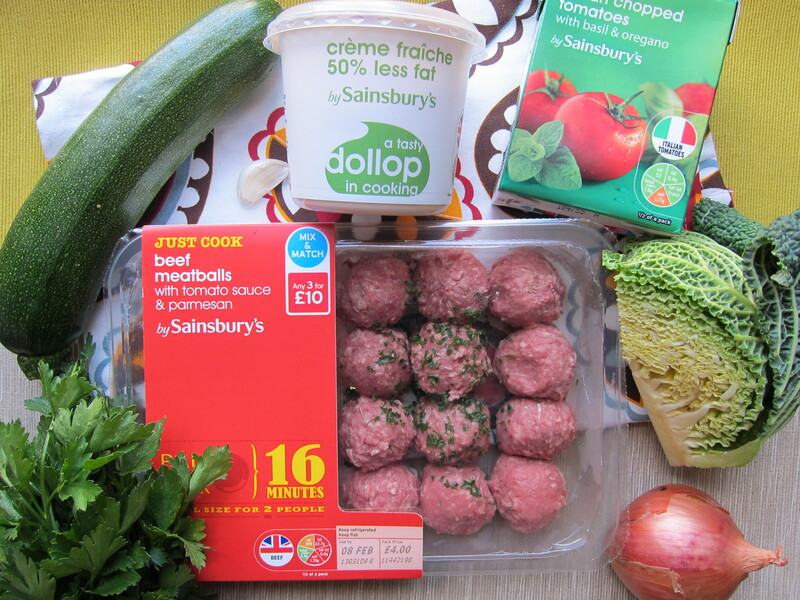 Sainsbury's 2 of your 5-a day meatball and lentil hotpot. Heat the oil in a large pan over a medium heat. Add the meatballs and cook for 10 mins, turning, until brown all over. Remove from the pan and set aside. Add the onion, garlic and paprika to the pan and cook for 5 mins, until the onion is soft. 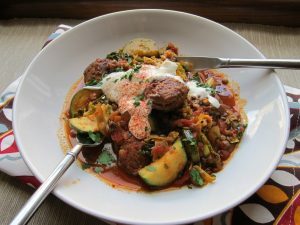 Return the meatballs to the pan with the tomatoes, stock, lentils and sachets of sauce and parmesan from the meatball pack. Turn up the heat and boil for 10 mins. Reduce the heat and simmer, covered, for 20 mins, until the lentils are tender. Stir in the parsley, cabbage and courgette, and cook for 10 mins. Serve with the crème fraîche sprinkled with the extra paprika and a scattering of parsley.